Man, if you are an apple cider lover in the fall, then I have some crazy good cocktails for you. This Fireball Cherry Apple Bomb will not disappoint and will warm you right up on a chilly fall night. The beautiful thing about this cocktail is you can easily make a kid version too. My kids love fancy mocktails. Just leave the fireball whiskey out and you have a great little cherry apple mocktail. If the ingredients are not obvious, this is a cocktail with apple cider, grenadine, ginger ale, and Fireball Whiskey. To top it off, you can drop a maraschino cherry or two to the top. 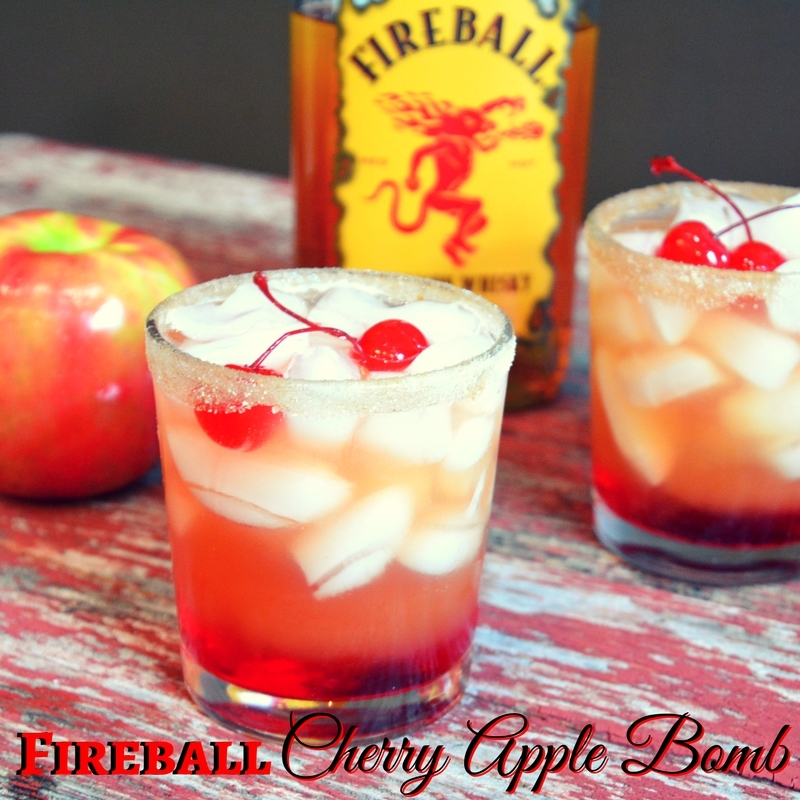 To make this Fireball Cherry Apple Bomb Cocktail is simple to make. In true Farmwife Drinks, this is a ratio of sorts. Start by filling a cocktail glass with ice. Then fill the bottom quarter of the glass with grenadine. Follow this with Fireball till half full. Fill the remainder of the glass with apple cider. I would also recommend leaving a little space for ginger ale. Then just drop those cherries on top. Finally just give the glass a big stir and enjoy! Nothing is better on a fall night then this fireball cherry apple bomb cocktail. Go ahead and fancy it up by topping it off with some cherries. Start by filling a cocktail glass with ice. Pour the grenadine, Fireball whiskey, apple cider, and ginger ale. Stir to combine and add the cherry garnish. Check out other great recipes at Weekend Potluck! Affiliate links were used in this post. This means I could make a commission off the links in this post.